Over a decade ago, the US National Science Foundation developed a program to research the notion of “decision making under uncertainty” (DMUU). DMUU has value for applying science to societal decision-making processes. The scientific community’s “job” is to focus on what we do not know and on reducing uncertainty in order to identify what unknown information would be most useful for decision makers. The reality is that most decisions are and therefore must be made with less than perfect information. It is important to keep in mind that, even with perfect information in hand, there is no assurance that the best possible decisions will be made. Perhaps it is useful to consider “decision making under foreseeability” which focuses on what we do know. Decision makers always have some usable information in hand and are often forced to make on-the-spot decisions. While scientific curiosity may have the luxury of time to focus on reducing any remaining scientific uncertainty. Timely decisions need to be made and decision makers cannot often wait for additional scientific discoveries. A key concept for decision makers, then, is “foreseeability.” People can relate to the foreseeability of the occurrence of an extreme hydromet event that had occurred in previous times, even though they do not know about the science-based probability of its recurrence at a specific place or point in time. The concept of foreseeability is used in the law as a qualitative expression of probability to determine accountability or fault when someone has been injured or killed (or when property has been damaged). Thus, a FORESEEABLE RISK could be viewed as a risk “whose consequences a person of ordinary prudence would reasonably expect might occur…” This concept clearly applies to decision making involving hydro-meteorological hazards and disasters. 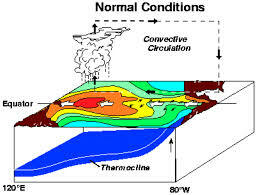 It is uniquely relevant for dealing with the uncertainties surrounding potential hazards spawned by climate, water and weather variability, extremes, and change. By its application we can foresee not only which adaptation measures should be considered for implementation and when, but can also identify in advance the first and second order ripple effects society and the environment of adaptation to a changing climate. It is also important to keep in mind that forecasting the physical aspects of an El Niño is different from forecasting its regional and local impacts. Different research skills are required for forecasting the physical aspects of the event and for forecasting both direct and visible societal impacts as well as its ripple effects throughout society and the environment. An El Niño event active since February 2015 will almost certainly last through 2015 and may extend into early 2016. The intensity of this event is beginning to increase with a peak expected in the last quarter of 2015. Potentially this could become one of the strongest El Niño of the last 20 years. However, favorable patterns of sea surface temperatures in the Indian Ocean could mitigate some of the negative impacts. Throughout 2014, inter-tropical Pacific sea surface temperatures rose steadily from the below average values observed in 2013. They remained near borderline values for sometime (October to February) before finally breaking the El Niño threshold (+0.5C) in March 2015. Although a full blown El Niño event did not develop until early 2015, the performance of the 2014 growing season in many places around the globe (Central America, parts of West Africa and Asia and Southern Africa in particular) was similar to that of under a typical El Niño.